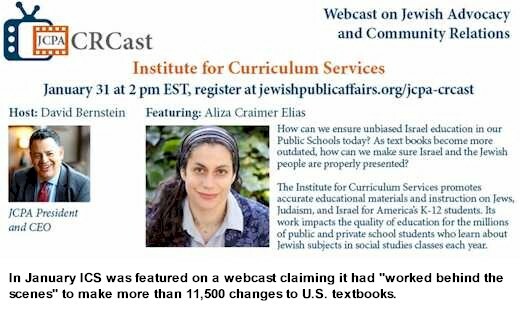 The Institute for Curriculum Services is a California-based non-profit organization that works "behind the scenes" to change curriculum and textbook references about "Jews, Judaism and Israel." 1. That ICS has successfully made 11,500 changes to textbooks across America. 2. When state education departments initiate textbook reviews, ICS works with Jewish Community Relations Councils (usually unincorporated units inside major Jewish federations) to contact textbook review committees to review and submit change requests..
3. Lead JCRCs submit these requested ICS changes. 4.Common requests include changing references to Israel's "wall," partially built across the Green Line, to "the security barrier" or simply the "fence." 2. Insistence on Arab agency in depictions of violence. For example that textbooks not say "War broke out between Israel and Arabs in 1948," but rather "Israel was formed, and Arab states attacked it." 6. Craimer Elias of ICS claimed to have overcome input from a Muslim-oriented group in the Pacific Northwest that similarly tried to influence textbook content. 7. The next initiative ICS claimed to be working on was the State of Virginia textbook review. JCPA President and CEO David Bernstein congratulated ICS saying he knew it received "a great deal of [presumably financial] support." Bernstein considers the "other side" of the "political spectrum" on this issue to be "the BDSers" (those calling for the Boycott Divestment and Sanction of Israel ) and "anti-Israel" groups. On February 1, 2018 IRmep submitted a Virginia Freedom of Information Act, §2.2-3704 request with the Virginia Department of Education for "all copies of input submitted from or on behalf of the Institute for Curriculum Services, Jewish Council for Public Affairs and or Jewish Community Relations Councils or Federations during the Textbook Review & Approval process for History and Social Science textbooks". Below are links to original PDF cover letters and responsive documents released by the State of Virginia on April 4, 2018. 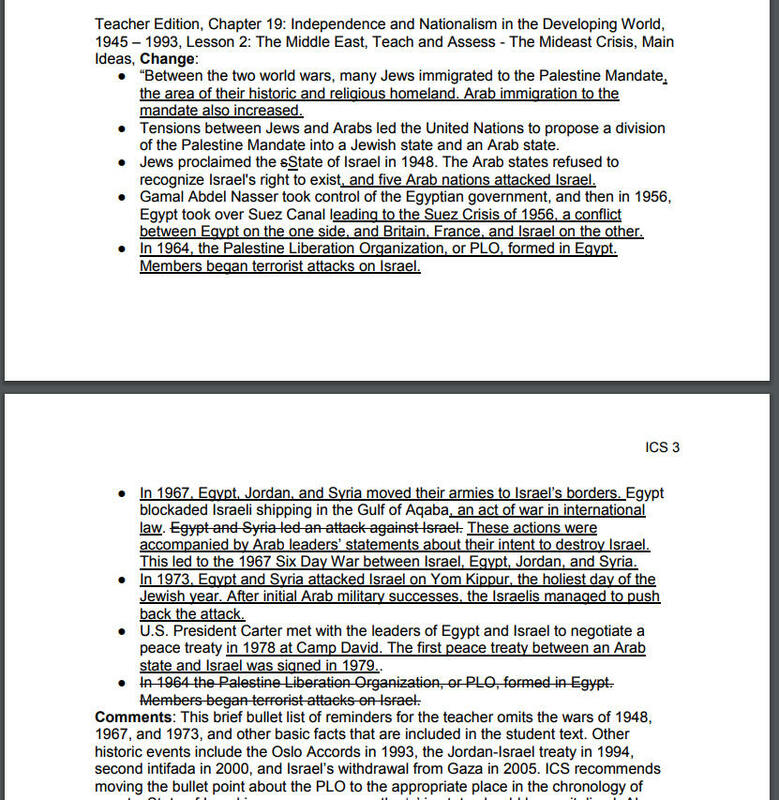 Below the PDFs are the Israel Lobby Archive's selection of ICS quotes and comments on interesting and misleading proposed ICS changes to textbooks. Qualify claims of Islam as "expressing Muslim religious belief" while referencing those of Judaism as "God's covenant." Emphasize the "Jewish ethnicity" of major American historical figures. Eliminate terms such as "settlers," "occupation," "land theft" and "wall" or replace with more neutral terms such as "disputed," "captured areas," "security fence" and "controlled." Emphasize Arab culpability for crisis initiation (Israel's 1948 War of Independence) leading to military action, but not Israeli culpability (e.g. surprise Israeli airstrikes on Egypt commencing the 1967 Six-Day War). Reference Israeli claims such as "Israel annexed East Jerusalem" as settled fact, without referencing lack of official recognition by other nation states. Delete all references to "Palestinian Territories." "This year, at our request, the Institute for Curriculum Services reviewed materials that have been submitted for consideration by the state in the 2018 History and Social Science Textbooks and Instructional Materials Adoption. They have made recommendations, which we endorse, to correct errors and misleading information regarding Judaism and Jewish history." ICS recommends the famous bluejeans maker be cited as Jewish. “One merchant who became rich during the gold rush was Levi Strauss. A Jewish German immigrant, he arrived in San Francisco in 1850..."
ICS recommends changing date references from BC and AD to the "common era" designations to avoid "Christian connotations." Also recommends replacing the Christian version of the Ten Commandments with the Jewish version. Suggests not including "artistic representations of God" in images because it is "forbidden in Judaism." References to Einstein should be "the German-born Jewish physicist Albert Einstein." Similarly, “The Jewish Austrian physician Sigmund Freud (froyd)" also suggested as a reference as well as “Jewish American poet Gertrude Stein …” Add underlined context, “By June 1945, the Nazis had massacred more than six million Jews, two-thirds of Europe’s Jewish population. Qualify reference to "Palestine" as "Mandatory Palestine." Change reference to "Israel occupying" to "in control of the Sinai peninsula, the Gaza Strip, the West Bank and the Golan Heights" after the 1967 Six-Day War. ICS comments that "This information appears when the student hovers over the map. Since Israel gained this territory as a result of a defensive war and was willing to return it in exchange for peace, the term 'occupying' should be eliminated." There is no apparent reference in the textbook to the fact that Israel initiated the war through a surprise attack on the Egyptian Air Force. ICS encourages, under Virginia standards, that "militant group" is too vague and that "The U.S. Department of State designated Hezbollah as a terrorist organization in 1997, so it is a more accurate description." ICS cautions that "Unguided internet research may lead students to websites containing politically biased, racist, hate-filled, and anti-Semitic materials highly inappropriate for the classroom. Including a list of reliable historical websites would be helpful." ICS praises past changes, "ICS has reviewed other editions of this text in the past and is extremely appreciative that so many agreed upon changes have been made to the current online Virginia edition of this textbook." Recommends changing: “How did the Balfour Declaration further undermine Pan-Arabism?" to "How did conflicting British policies threaten Pan-Arabism?" Recommends "murder" rather than "kill" in Holocaust descriptions. Insistence that students not be asked to consider Palestinian refugees without context. "As noted in the textbook, equal numbers of Jewish refugees were expelled from Arab lands and fled to Israel. Asking students to focus exclusively on Palestinian Arabs is not a balanced pedagogical approach. By recasting the assignment to include Jewish and Arab refugees, students will gain deeper understanding of the refugee crisis that emerged after the 1948 Arab-Israeli war." Cautions against the Holocaust as a sole reason for the establishment of Israel. "Students often wrongly believe that the sole reason for Israel’s creation was the Holocaust. While the Holocaust certainly galvanized the international community to recognize the need for a Jewish home, it is important to also note the decades of state building efforts by Jews in the Land of Israel (starting in the 1880s)." ICS recommends a statement to contextualize Palestinian refugees that "Israel absorbed an equal number of refugees from Arab and Muslim lands." 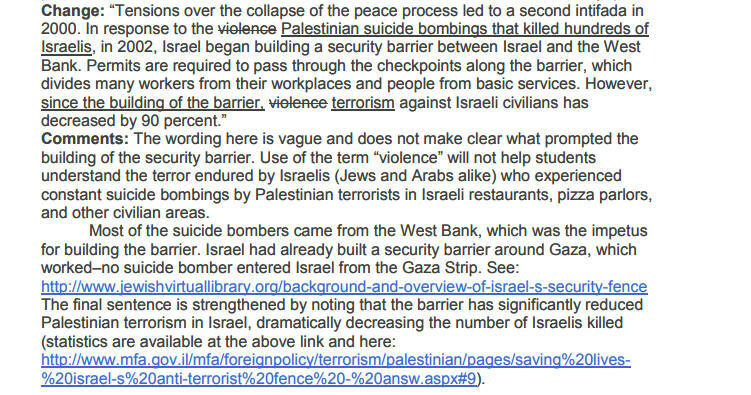 Also recommends that "Students should understand that not all Palestinian Arabs live as refugees or in refugee camps. Palestinian refugee status is a political construct that should not be equated with the conditions faced currently by Syrian, Kurdish, or Iraqi refugees." Also insists that "There is no state of Palestine nor has there ever been one. The change in title better reflects the historical reality. Students should understand that the conflict is between Israel and the Palestinians. The title should be changed throughout." Insistence that Gaza, Sinai and East Jerusalem were "captured" in a "defensive war." Change references from "occupied territories" to "captured areas." Delete "occupied territories" and references to "Jewish settlers" and instead insert, "Later, Israel annexed East Jerusalem and the Golan Heights. Israel then allowed the building of homes and communities in some of these areas, which the Palestinians opposed." Eliminate reference of Palestinian desire to "reclaim their lands." Discuss "Israeli presence" rather than :the "occupation." Delete references to Arab perspectives of Israeli "theft of Palestinian lands." Muslims?” because, according to ICS, "The status of the Quran as revelation is a religious belief. Therefore, it is more appropriate for students to consider the role of Islamic law in Muslims’ lives." Recommends citing the Anti-Defamation League for information about anti-Semitism, "Virginia standards encourage the teaching of the history of anti-Semitism. Blood libels were a significant feature of medieval Jew-hatred. Additionally, blood libels continued into the early modern and modern periods so this is a significant concept for student understanding of the history of anti-Semitism (see “Blood Libel: A False, Incendiary Claim Against Jews.” Anti-Defamation League. https://www.adl.org/education/resources/glossary-terms/blood-libel. Accessed February 20, 2018.)." ICS recommends adding “Aaron Copland and George Gershwin, Jewish composers who wrote uniquely American music.” Comments that "Descriptions should highlight the diverse identities of American historical figures. Gershwin and Copland’s Jewish identities should be noted in the student text as well." ICS recommends changing a term about civilization from "By contrast, the Hebrews established their civilization along the Mediterranean." to "By contrast, the Israelites established their civilization along the Mediterranean." ICS recommends that the following underlined text about Ethel Rosenberg in a section about nuclear espionage for the Soviet Union be added "It would also make it clear that Julius Rosenberg had indeed passed atomic secrets to the Soviets, but it is likely that Ethel Rosenberg was wrongfully convicted.” ICS comments that "The text should acknowledge Ethel Rosenberg’s likely innocence. There is room in the text for this change." ICS demands deletion of references that Palestinians expelled during Israel's creation were not compensated for their lands and homes. Insists that Jewish expulsion from Arab countries during this time was an "equal number" to Palestinian refugees. ICS notes that "In the context of war, when populations flee, they don’t usually receive compensation, so the sentence above should be deleted and leaves unanswered a question that applies here and in all cases. The question would be who should have paid for land and homes and how when people fled in the chaos of war - the Arab states who started the war? Israel?" ICS insists that the 1967 Six-Day War was the result of "Arab hostilities" without reference to the Israeli surprise attacks that initiated military action. "The text should clarify that the 1967 and 1973 wars were the result of Arab hostilities." ICS recommended cartoon for Commonwealth of Virginia textbooks. ICS insists that references to Israel controlling or ruling the West Bank and Gaza be dropped. ICS recommends changing an exercise commenting on the political cartoon "The Mideast Peace Game Rules" with a cartoon featuring a game of Twister with a terrorist wearing a suicide belt telling players how to play. "ICS recommends removing the editorial cartoon, 'The Mideast Peace Game Rules,' and related questions. The activity does not provide students with the tools necessary to understand the complex issues under discussion. The cartoon suggests moral equivalency between Palestinian terrorism and Israel’s right to defend its borders from attack. The 'rules' listed are reductive, suggesting that the conflict is inevitable, insoluble, and that both sides share equal blame." ICS recommends deleting "Israel's invasion of Lebanon" as a possible answer to an "Obstacles to Peace" question and replacing it with "Hezbollah rocket attacks on Israel" because "None of the possible responses mention the Palestinians. Singling out Israel is unbalanced. The response as written implies that Israel was the aggressor. Israel’s entry into Lebanon was a defensive effort to end years of Hezbollah rocket attacks and incursions. The suggested change reflects this reality. The change also verifies that students can differentiate between Hezbollah and Hamas." ICS recommends the following change to a map of referencing the Golan Heights. "The map should indicate the status of the Golan Heights. Currently, the map gives the impression that the Golan Heights are part of Syria. Israel captured the Golan Heights in 1967." ICS recommends deleting references to Israeli Prime Minister Ariel Sharon as a "Hawk" because "the usage of 'hawk' is confusing in this context since the only definition of the term appears in a previous chapter where it is applied to people who supported U.S. military intervention in the Vietnam War." ICS demands deletion of Christian religious depictions. "Module 3: People and Ideas on the Move, Lesson 5: The Origins of Judaism, Moses and the Exodus, Jewish Scripture and Tradition, image, Delete: image of Moses Comments: This painting by Ugolino di Nerio is part of a greater series of paintings depicting Christian images. Use of Christian iconography instead of Jewish iconography is inappropriate in lessons focused on Judaism or Jewish history." "Module 3: People and Ideas on the Move, Lesson 5: The Origins of Judaism, The Kingdom of Israel, Biography, King Solomon, Change: image Comments: This painting by Pedro Berruguete was painted for a Christian audience. Use of Christian iconography instead of Jewish iconography is inappropriate in lessons about Jewish topics." ICS recommends deletion of a video by Iranian-American author, religious studies scholar, producer and television host Reza Aslan. "The segment of the video featuring Reza Aslan uses a name for God that is not used in Judaism and should be removed. It is a common misconception that Jews refer to their god as 'Yahweh', rather it is a Christian interpretation of the Hebrew consonants that are said to make up the tetragrammaton, the four-letter ineffable name of God. The segment should be deleted or the video removed." In an enrichment activity, ICS recommends deleting an activity based on reading the biography of Palestinian legislator and PLO member Hanan Ashrawi. "Change: 'Read about the contributions of Hanan Ashrawi to the Middle East peace process.' Comments: ICS recommends deleting this activity or changing it to a 'reading check' rather than an enrichment tool. Given that the activity consists of reading a biography of Hanan Ashrawi and answering two questions, it would be more appropriate for a more minor evaluation. If the publisher wants to present an enrichment activity similar to this, they could ask students to write an essay on advancements by both sides in the Israeli Palestinian peace process." ICS recommends Golan Heights reference be changed from "officially part of Syria, but most of it has been occuppied by Israel" to "has been controlled by Israel." ICS notes "This paragraph on the physical geography of the Golan Heights should state the facts of control of the region in a neutral tone rather than making a political judgment about its status using terms that make an argument about who should or should not control the area." ICS recommends a photo deletion. "Delete: Photo of Israeli soldiers at the security barrier pointing assault rifle. Comments: The photos accompanying the student text are balanced, with positive nationalist images of both Israelis and Palestinians, and a selection of images of family life of both Israelis and Palestinians. This unfortunate politically loaded image is only accessible in the teacher edition, but it should be deleted so that teachers do not project the image, which is at odds with the balanced imagery in the student text. It is inflammatory and makes a political statement inappropriate for a public school textbook. There are no images of Palestinian weapons, rockets, violence, or terrorism." ICS recommends deleting as a teacher reference Basem L. Ra'ad's "Hidden Histories: Palestine And The Eastern Mediterranean" claiming "The Basem L. Ra’ad book is extremely one sided and not an academic balanced neutral book, and so should be deleted from the list. The teacher’s edition suggests the books can be found at your local library, but all three were not available from our large local library that also has access to a large digital collection. There are better books available to tell the perspectives of both sides and so should be included." ICS recommends non-inclusion of a video that "covers only Islam and focuses on the attachment of Muslims to Jerusalem. It has only a brief mention of Judaism and Christianity, and its adherents attachments to Jerusalem. No videos on Judaism or Christianity are provided. Students do not have enough information to 'evaluate the different perspectives on the deep religious beliefs and ethnic attachments centered in the city of Jerusalem.' Add videos on Judaism and on Christianity and their relationship to Jerusalem." ICS recommends dropping a "confusing" exercise because "Israel proper is not disputed but the territories of the West Bank and Gaza are." ICS demands that a video resource titled “Israel Palestine Water” be deleted, commenting "This inflammatory and imbalanced 2:41 minute video accuses Israel of violating international law in their control and distribution of water in the West Bank and of environmental degradation. The content and tone is completely different from other videos in this textbook. This is an overtly polemical video and is completely inappropriate for a public school instructional resource. The allocation of water resources in this region is complicated by both internal Palestinian politics and corruption, and by the failure of the peace process between Israel and Palestinians. The situation is not as dire as shown in the video, nor is the issue completely one-sided. There are actually a number of examples of environmental cooperation taking place between Israel, Palestinians, and other Arab neighbors. This video seems to be more produced for shock value than scholarly accuracy. There are not clear sources or attributions, though CBS news is mentioned at the end and the BBC Motion Gallery Education is printed on the opening shot of the video. This video is also accessible from a search in the student edition, and from the teacher edition the teacher can project it to students, and so it should be deleted everywhere." ICS recommends deletion of B.C. and A.D. "The textbook uses the Christian dating system throughout the book. The Common Era notation is a religiously neutral alternative preferred by scholars, academics, and educators. Use of the Christian dating system, B.C. and A.D. (Before Christ and Anno Domini, in the year of our Lord) is not neutral and is not appropriate for public school textbooks, and B.C.E. (Before Common Era), and C.E. (Common Era) is more appropriate and used by growing numbers of states’ social studies standards, including Virginia’s which uses both systems together. In social studies state standards, at least 20 states use the Common Era B.C.E. / C. E. dating system or no dates, while six states use both dating systems, and one uses exclusively the Christian dating system." ICS recommends addition of following influences. "Given the clear influence of Judaism on western civilization including major legal concepts like rule of law, idea of a day of rest, ethical monotheism, and more, this should be mentioned." ICS recommends using a picture of Charlton Heston as a representation of Moses. The existing image was not appropriate because, "This image of Moses has horns of light from his head. The image of horns on Moses' head, based on a mistranslation of the 'rays of light' that the Torah says emanated from Moses' head after he spoke with God, has served as the basis of the ugly antisemitic belief that Jews have horns. Any presentation of this important image in the history of Western art ought to discuss this unfortunate legacy based on a mistranslation. However, this section of text is not the appropriate place for that discussion. 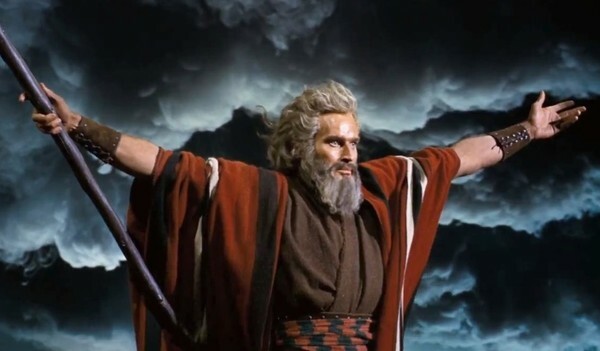 Another depiction of Moses (even something as familiar as a photograph of Charlton Heston's portrayal from 'The Ten Commandments' or perhaps from the animated film 'The Prince of Egypt') should be used instead." 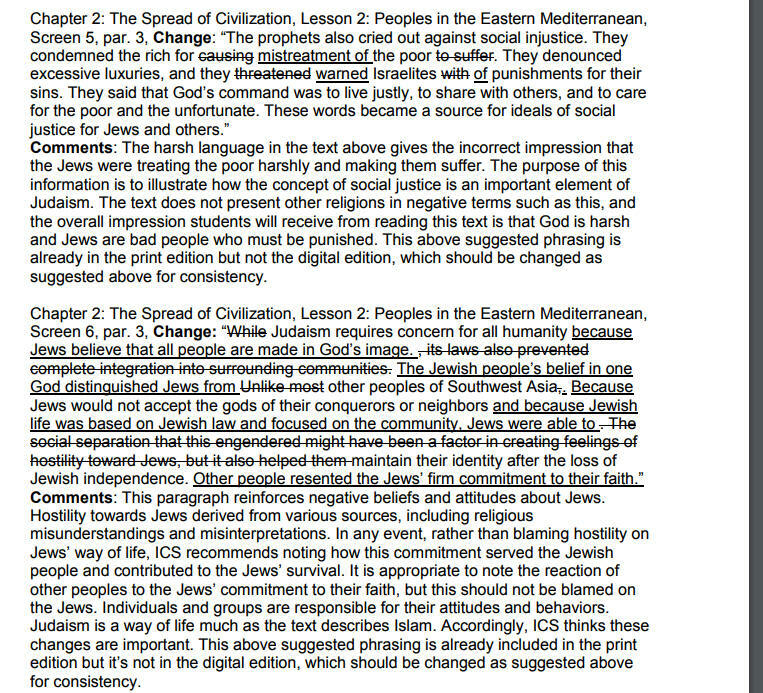 Objections to analysis of "social separation"
ICS again recommends that references to "occupation" be deleted. "Change: '1987 The Palestinian intifada (uprising) begins in territories occupied controlled by Israel.' Comments: For 1987, the text should describe the territories as 'controlled' by Israel since it is a politically charged word and the text does not use the word 'occupied' in relation to other countries’ actions, nor in other places in the textbook." ICS insists on an expanded discussion about the "wall" but no discussion of the controversial route it takes or greater impact on Palestinians. ICS suggests inclusion of an Israeli Ministry of Foreign Affairs web resource.